There it is again. Did something die? I turn my head again. All I can smell is the sweet scent of the double Mock Orange, Philadelphus x virginalis, pure, white flowers gently swaying in the breeze. No, something did not die in the garden. 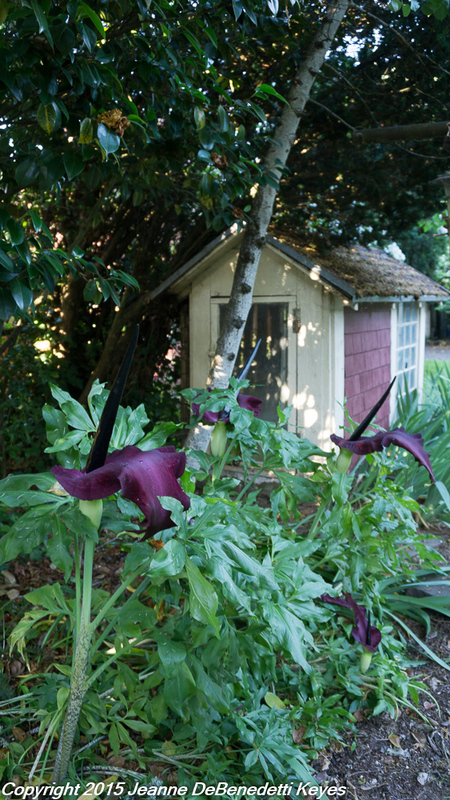 It is just the voodoo lilies, Dracunculus Vulgaris doing their thing. 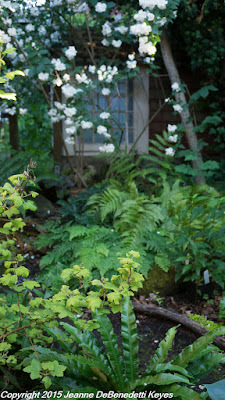 The recent hot weather in Portland, Oregon has enticed these stinky arums to “bloom” with full force. Dracunculus vulgaris, also known as the dragon Arum, is a member of the Araceae family and is native to the Eastern Mediterranean. The foliage is quite beautiful; medium green palmate leaves with white flecks. The stalks are an attractive mottled green and maroon pattern. But it is really the “flowers” that impresses most people, well and the smell, of course. The bloom is made up of a large, curly-petaled, maroon spathe, with an almost black spadix. The flowers are actually in the base of the spadix, with the male and female flowers stacked together. Dracunculus, Zantedeshia, Amophophallus, Colocasia, and Arisaema are all arums with a spathe and spadix arrangement. After the bloom has been pollinated, the whole plant will collapse and dry out as it goes into dormancy, producing a bright, red seed pod. The bulbs or rhizomes are shaped like an alien space ship, 3-6 inches in size, with the mother bulb carrying the little daughter bulbs on the top of the bulb, allowing the plant to multiple by offset as well as by seed. I love to see peoples’ reaction to this plant. Some people love them, some people can’t understand why I don’t immediately dig up these horrible smelling, spooky “flowers” and throw them into the nearest dumpster! They certainly are unusual. 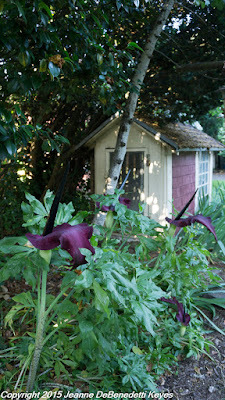 I consider Dracunculus Vulgaris the Calla Lilys’ (Zantedeschia aethiopica) slightly sinister sister on steroids. And yes, the plants do put out a very strong smell of carrion or rotten meat to attract flies for pollination. Let’s be honest here. Cool, cloudy weather lengthens the lifespan of the bloom and the smell can last for a week. Kind of puts a damper on the Father’s Day barbeque. 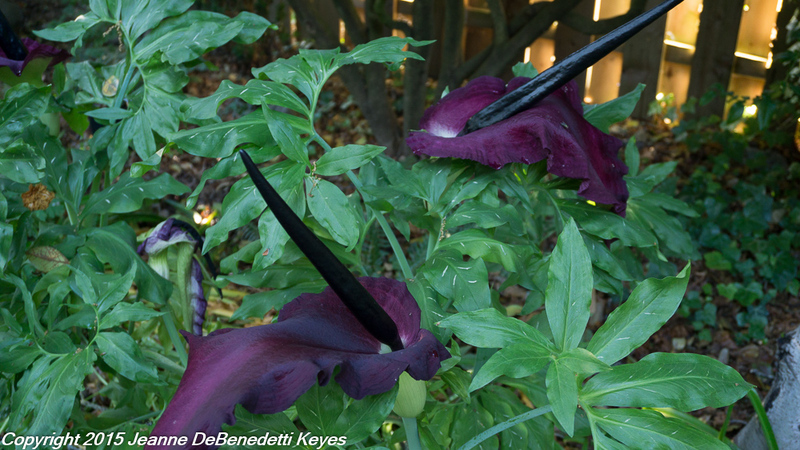 If you are into wild, wacky and usual plants, this voodoo lily is for you! I think they're absolutely cool, but I don't have any growing in my garden. They are cool but it is best to site them properly - not near the front or back door! LOL! If you want any, just ask! I quite agree. The "petal" are a deep rich red and velvety soft, Never mind the few flies moving around.